Corey meets Corey, though only one of them makes the poster. I wrote a review of The Secret of My Success as the previous part in this series. Success was a film I enjoyed a lot as a kid, a film that I thought was good, but, as it turned out, wasn’t really all that good. 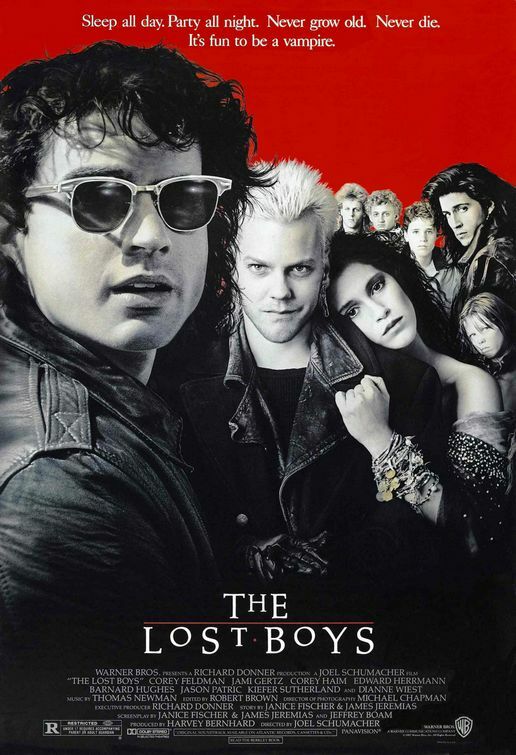 I never had any illusions that The Lost Boys was any good. I always thought it was really pretty dumb, though as a kid I found it more entertaining than I do as an adult. So why am I reviewing it as part of this series? Well, because the final line of my Success review was “Which, in 1987, puts it at #76, right between Dirty Dancing and The Lost Boys.” That was a comment that provoked some grumbling from Veronica and she thought I should watch it again. So I got it from Netflix and it sat for two months before we finally got around to watching it. Veronica’s summation of it after watching it again for the first time in a really long time: “Too much Corey Haim, not enough Corey Feldman.” And my response? Well, you might have noticed that it’s dropped from #77 to #92. It’s still coming in at **.5, but it dropped from a high **.5 to a low **.5. So, before I deal with the film itself, I’ll deal with what, for me, is the elephant in the room: Veronica’s one-line summation. I’ll remind those who have forgotten (or those who were too young to know) that this was the first film to co-star two actors who would be linked for the rest of their lives (of the rest of one of their lives anyway): Corey Haim and Corey Feldman. (I have to always remind myself that Corey Haim isn’t in Goonies – it’s Sean Astin). Both Coreys had been working their way up – Feldman had been in a Friday the Thirteenth and had been noticeable in the ensembles of Goonies and Stand by Me while Haim had gone from playing Sally Field’s son in Murphy’s Romance to teen heartthrob status in Lucas (although maybe being in Lucas was not a good thing – four stars – one now dead, one long retired, one completely bonkers, which only leaves Winona Ryder and her career isn’t in great shape these days). But after this film the two would become close friends, starring in a couple more films together (License to Drive and Dream a Little Dream – the first is pretty bad and the second is charming) before they both would get heavy into drug problems. There were a lot of girls my age who crushes on the Coreys, though, certainly among the ones I knew it was very heavy in favor of Corey Haim. But not for Veronica. In fact, in a questionnaire that a manager at the B&N we met at used to give out she mentioned Feldman as her first childhood crush (Mine? Carrie Fisher in The Empire Strikes Back). With his long hair and odd looks I never fully understood that (full disclosure that Veronica often questions my taste in actresses – she agrees with me that Cate Blanchett is a hell of an actress but doesn’t get why I also think she’s gorgeous). The odd thing about this being the breakout film for the two Coreys is their presence in the film. Corey Haim possibly might have the biggest role in the film – certainly the biggest role outside of Jason Patric. But since it was the vampires themselves that were to be marketed, there he is hiding in the background of the poster. But, hey, that’s better than Feldman. Because the primary cast members are listed alphabetically on the poster, Feldman is actually the first cast member listed and yet he doesn’t make the poster at all. In fact, there are 8 actors listed on the poster and 8 actors featured on the poster and only four overlap. The other interesting thing is that Feldman’s role isn’t that big in the film, as the vampire hunting Edgar Frog. But, hey, at least Feldman is considered prominent. Can you name the actor who played the other Frog brother? Well, his name is Jamison Newlander and that was basically it for his film career. So far I have written a lot without really saying anything about the film itself. So, here goes. This film gets two things really right. The first is the soundtrack. Combining a couple of good original songs (Lou Gramm’s “Lost in the Shadows” and the hauntingly eerie “Cry Little Sister” by Gerard McMann) with a nice cover of “People are Strange” by Echo & the Bunnymen the music works throughout the film (especially when they return to “Cry Little Sister” later in the film). It’s not exactly a Scorsese soundtrack but it’s surprisingly effective. The second thing the film gets right is the art direction, and the key thing it does there is a pass a test that is demonstratively failed in the second Pirates of the Caribbean film. Think of the island in Pirates where the treasure is buried. Specifically think of the ruined church. What the hell is an ancient ruined church doing in a film taking place in the early-to-mid 18th Century? When the hell was it built? By whom? It looks really great but it makes no sense. It’s an extension of what I call the Red October test (see here for more). Now, The Lost Boys, aside from the regular sets on the Santa Cruz boardwalk (renamed Santa Carla for the film) and the wonderful large house that the brothers live in (which all makes sense given the grandfather’s personality) has one truly magnificent set – the vampire cave. In a movie where this isn’t well thought out this set would just look cool, with its natural / decorative combinations (complete with Jim Morrison poster – an oddity since the Doors song on the soundtrack isn’t sung by them, but that’s a minor point). But the writers actually thought this one out – it was once a magnificent hotel overlooking the ocean and when the 1906 Earthquake shifted the whole of Northern California it sent it crashing onto the rocks down below, nestling it up against the cave. So, instead of just a magnificent looking set piece, we have a magnificent looking set piece that also makes sense, complete with an interesting back story. I have to give full kudos for thinking that one out. Well, that’s the good stuff. And that’s just about it. What about the bad? Well, how about the visual effects, for one? The early vampire attacks are meant to be more suggestive, but since every advertising bit already made clear they were vampires, why film scenes that are so bad? And what about the acting? Well, none of the people involved in this film are exactly great actors except Dianne Wiest (I pointed out to Veronica that in the same year that this film was released she was also in two Woody Allen films and she won an Oscar for the Woody Allen film she was in the year before) and sometimes Edward Herrmann. Veronica tried to object that Kiefer Sutherland is good (“What about 24?” she asked. “In 24 he just yells ‘Where is the bomb?’ and then when he gets no response he yells it louder,” I replied.). Kiefer can sometimes be good (see Stand by Me), but here he is just ridiculous, and sadly, he is, by far, the best of the actors playing vampires. And don’t even get me started on how bad the two Coreys actually are in the film, especially when they’re trying to out-posture each other in the comic book store (“He’s not as bad as his shirts,” said Veronica about Corey Haim). And then there are the plot issues. Like “Don’t invite a vampire into your house. It renders you powerless.” Where the hell did that come from? The invented vampire mythology as opposed to all the other stories that mention that vampires have to be invited in? Or, the notion that Laddie and Michael suddenly become full-fledged vampires for no apparent reason. If that happens to them without a kill, why didn’t it happen with Star who’s been a half-vampire much longer? Did Jami Gertz just not want that stupid vampire makeup? And when Laddie suddenly bursts through the couch, why does everything fly around like it’s being pushed around by a wind machine? (Oh, wait, that’s because it is and it’s just bad visual effects again). If you think Phantom is Schumacher’s second best and you hated that…I assume you didn’t like Phone Booth at all?